Dear Applicants, Municipal Corporation of Greater Mumbai has recently published employment notification for 867 Staff Nurse (Parichalika) Vacancy. Candidates who are interested and eligible for MCGM Recruitment 2018 apply offline here. You can fill application form either here or official site from 28th April 2018. Applicants can fill their MCGM Staff Nurse Vacancy application form till last date 14th May 2018. Furthermore details of Mumbai BMC Jobs you can collect from below paras. Here our team provide you all information. Municipal Corporation of Greater Mumbai is inviting prescribed application for 867 Staff Nurse Vacancy. Interested and eligible candidates may apply through offline mode. This is a golden opportunity for candidates who are waiting for MCGM BMC Recruitment Notification 2018. Candidates who are interested in Mumbai MCGM Jobs must check that they are eligible or not. Here you can also collect application fees, selection procedure, how to apply and others. What is the Important date For BMC Recruitment 2017 For 1388 Labour Jobs ? How To Apply Application Form For MCGM Recruitment 2017 – 18, BMC Asst Professor Posts ? Applicants who are interested for MCGM BMC Vacancy 2018 must eligible for staff nurse vacancy. The details of eligibility such as education qualification, age limit and others. Candidates must ensure that they are eligible or not for MCGM Staff Nurse Jobs 2018. The eligibility criteria is mention on below paras. Candidates who are going to apply for BMC Staff Nurse Jobs 2018 must completed their 12th Class examination. Applicants also have General Nursing & Midwifery Diploma (03 years and 06 months). For MCGM Staff Nurse Recruitment applicant should be registered with Maharashtra Nursing Council. Applicants must fulfill Furthermore details check official notification of MCGM Staff Nurse Vacancy 2018 properly. The age criteria is made on the basis of starting date i.e 28.04.2018. The MCGM Recruitment 2018 maximum age required for General & other unreserved category is 38 years. Upper age relaxation is applicable as per govt. terms. 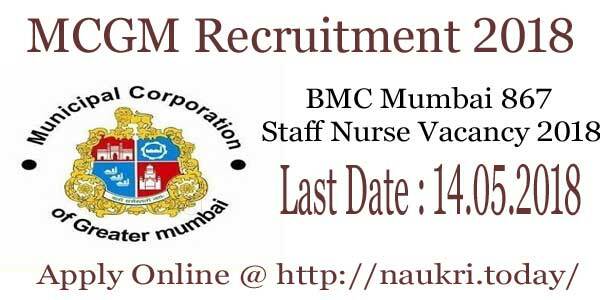 05 Years relaxation is applicable for BMC Staff Nurse Vacancy for reserved category. PWD candidates should not be more than 45 years. 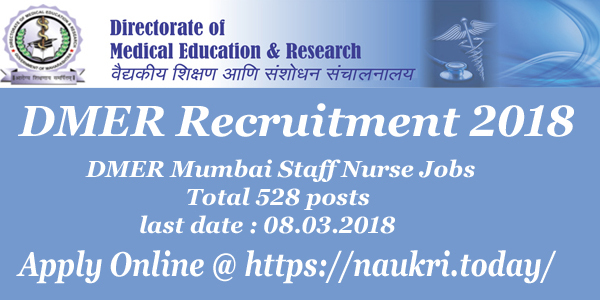 Furthermore details you should read official notification of MCGM Staff Nurse Jobs 2018. Selection of the candidates will be made on the basis of written examination and personal interview for MCGM Recruitment 2018. Final merit list will prepare according to candidates performance in written test and personal interview. Candidates should check BMC Recruitment Notification for more details. There is no application mention on official notification. All applicants are not required to pay any fees for MCGM Vacancy 2018. Furthermore, details check official notification. After selection of candidates they will receive attractive salary from the department. For MCGM Jobs 2018 the monthly salary is Rs. 9300/- to Rs. 34800/- with Grade pay Rs.4200/-. Furthermore details check official notification. Interested and eligible candidates may apply for Brahinmumbai Municipal Corporation Jobs 2018 through offline. Applicants must fill the application form before the last date 14.05.2018. Before filling up MCGM Staff Nurse Vacancy 2018 candidates must have valid documents. Appliers also have one passport size photograph. After then you should follow given below procedure of BMC Recruitment 2018. First of all go to official site www.mcgm.gov.in. Download MCGM Notification for Staff Nurse Vacancy. Click on the link and read the notification carefully. After that download BMC Mumbai Recruitment Application Form. Fill the form with all correct details. Paste photograph on appropriate place. Give signature also on Brahinmumbai Mahanagarpalika Vacancy application form. Duly fill application form along with all require documents sent to MCGM Head office. Conclusion : Municipal Corporation Greater Mumbai has recently issued notification for recruitment of 867 Staff Nurse post. Applicants who are interested and eligible for MCGM recruitment 2018 can fill the prescribed form from 28.04.2018. Closing date of submission Mumbai BMC Job application form is 14.05.2018. Furthermore information read full article carefully. Municipal Corporation of Greater Mumbai has released Recruitment notification of 1388 Labour/worker/Room Keeper & Other Vacancies. Applicants who are interested in MCGM Recruitment 2017 – 18 Labour Jobs can fill online form here till the last date. Submission of online form for MCGM Vacancies has been started from 11.12.2017. You can submit your BMC Mumbai Jobs Online form on or before the last date 31.12.2017. 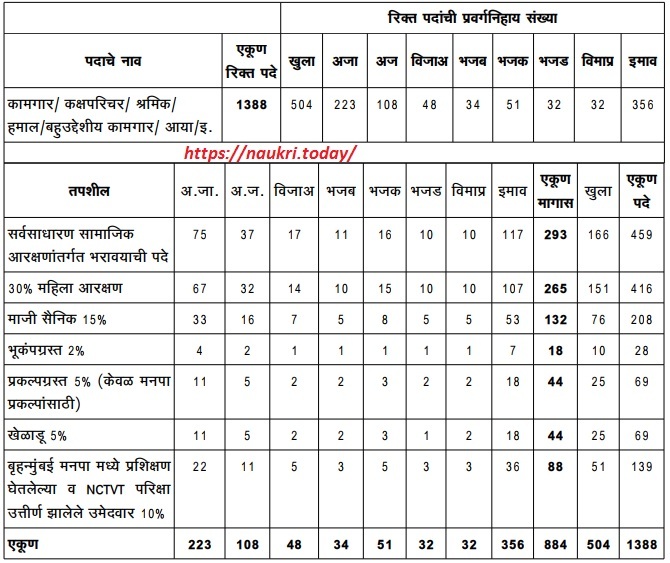 बृहन्मुंबई महानगरपालिका is inviting online form for filling up 1388 MCGM Labour Vacancies. This is great job opportunity for all the candidates who are searching BMC Recruitment Notification 2017. Applicants who are going to fill online form for MCGM Jobs must check required eligibility criteria from here. We are describing full details about BMC Mumbai Vacancies like Eligibility Criteria, Pay Scale & selection Method in the below article. Latest News as on 17.01.2018 : Dear Applicants, BMC Mumbai is going to organize 1388 Labour Vacancies written Examination. Applicants who have filled online form for can download your MCGM Admit card 2018 form here. Link of downloading BMC Call letter is shown below. Applicants in the below section we are providing category & reservation wise distribution of MCGM Labour Vacancies. Candidates can check category wise Labour & Other Vacancies from here & Also check more details about Vacancy division from official BMC Notification. If you are looking for MCGM Labour Jobs Eligibility Criteria then read the below section. In the below section all details related to eligibility Criteria like Education & Age Limit for BMC Mumbai Recruitment is mentioned. Applicants can also read these details from official notification. Applicants must have passed Matriculation (10th) call with Marathi subject from any recognized Board for MCGM Vacancies 2017. More information about Labour/Room Keeper/ Worker Vacancies Education Qualification then check from official advertisement. Age of the candidates for MCGM Recruitment 2017 – 18 must be in between 18 years to 38 years. relaxation in upper age limit for BMC Recruitment 2017 is applicable only for reserved category applicants on the basis of Department rules & regulation. Candidates of Unreserved Category must paid Rs. 800/- for applying online form for Mumbai BMC Vacancies. remaining category applicants of SC/ST/ESM must pay Rs. 400/- as application fees for MCGM Recruitment 2017 – 18. Those candidates who will selected for BMC Labour Vacancies, will paid good salary as per Department Norms. In Starting Candidates will paid Rs. 5,200/- to 20,200/- with grade pay Rs. 1,800/- for MCGM Labour Jobs 2017. Written Exam will be objective type Online exam. Exam contain total 100 Question of 100 Marks. Exam is available in Marathi & English language. Question paper will contain 04 subject Question like Marathi –40, English – 10, GK – 25 & Arithmetic Logical reasoning – 25 Ques. Applicants you can get more information about BMC Recruitment 2018 from here, keep stay with this page for more updates. Eligible & Interested candidates for MCGM Recruitment 2017 – 18 can fill online form here for Mumbai Mahanagarpalika vacancies. Here our naukri.today team is providing step by step process of applying online form for BMC Recruitment 2017. First read all steps & then follow while applying Brihanmumbai Mahanagarpalika Jobs Online form. Candidates log on to the official portal www.mcgm.gov.in. Now click on मुंबई महानगरपालिका भर्ती Section. Then click on Official MCGm Labour Jobs Notification link. Read all the information & Instruction mention in notification. Fill all required information in BMC Online form properly. Then upload your recent passport size photo & signature in form properly. Take print out of MCGM Jobs Online form for future use. Conclusion : – MCGM Recruitment 2017 – 18 For 1388 Labour/Worker/Room Keeper & Other Vacancies. Candidates can fill online form here for BMC Mumbai Recruitment on or before the last date 31st December 2017. Check more details about BMC Labour Vacancy by reading the above article. Dear Applicants, Brihanmumbai Municipal Corporation has released notification of Assistant Processor Vacancies. There are total 115 BMC Mumbai Vacancies of Speciality & Super Speciality Asst Professor. Those candidates who are interested in MCGM Recruitment 2017 – 18 can apply application form through offline mode from here. Submission of Application form for BMC Recruitment 2017 – 18 has been started from 11.12.2017. Last date of submit मुंबई MCGM Vacancies is 26th December 2017. Municipal Corporation of Greater Mumbai is inviting application form for those candidates who are waiting for MCGM Jobs 2017. Now the submission of Application form for Mumbai BMC Vacancies has been started. This is great job opportunity for all the candidates who are waiting for Jobs in Mumbai Mahanagarpalika. To get more information about MCGM Assistant Professor Jobs 2017 like Eligibility Criteria & Other you can check from below article. Candidates, you can check post wise required Eligibility Criteria like Education, Age & Other details for MCGM Vacancies from here. You can also check these criteria which is also mention in your BMC Mumbai Recruitment Notification. Candidates must have done Graduate/ Master’s Degree in respective trade from any recognized University for MCGM Vacancies. More information you can collect from official BMC Mumbai notification. Maximum age of the candidates for MCGM Recruitment 2017 – 18 must be 35 years. Relaxation in applicable up to 05 years for Resaved category candidates for BMC Recruitment 2017 for Assistant Professor Jobs. For General Category candidates application fee must be Rs. 300/- + GST. Other reserved category candidates must need to pay Rs. 200/- + GST for BMC Recruitment 2017. Candidates who will selected for BMC Mumbai Vacancies, will paid Rs. 15,600/- to 39,100/- with grade pay Rs. 6,000/-. Other allowances will paid as per Organization Normalization. Selection of the candidates for MCGM Recruitment 2017 – 18 will made on the basis of Qualification & Interview. For more information you can check official Mumbai Mahanagarpalika Vacancies Notification, which is mention below. Eligible Candidates can fill application form for MCGM Mumbai Vacancies from here before the last date. Here we are providing step by steps process of applying application form for BMC Recruitment 2017. First read all steps & then follow while applying BMC Mumbai Jobs Application form. First of all candidates visit to the official website www.mcgm.gov.in. Now click on Recruitment Section & Click on Official BMC Mumbai Jobs Notification link. Read all the information from MCGM Recruitment notification properly. Now collect application form on given address. Then fill all required information in form properly. Recheck all filled details before submit BMC Bharti Application form. Conclusion : – BMC Mumbai Recruitment 2017 – 18 for 115 Assistant Professor Vacancies. Candidates can fill application form for MCGM Recruitment 2017 – 18 on or before the last date, 26.12.2017. I am a mechanical draftsman course in mumbai. In 3 years Diploma in school.